Happy Easter! My eldest son thinks it is pretty great that Easter falls on April Fools’ Day. He has been trying to think of little pranks he can pull. Two of my favourite ideas from Facebook I have seen are wrapping grapes in foil to look like chocolate eggs and telling the kids the Easter Bunny is planning to bring vegetables this year! While April Fools’ Day has been around for several centuries, Easter is an older tradition, and one rooted in a much more serious and joyful event. When the women went to the tomb that Sunday morning, it was in a state of deep grief. Their hope and future was all in Jesus, and he was gone. They were afraid, as they thought about how to get to Jesus’ body to anoint it properly and how to deal with the guards left there by Pontius Pilate. 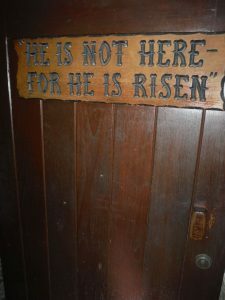 Their fear was heightened as they saw the empty tomb and wondered what had happened to the body of their Lord. Finally, they experienced shock and joy as they learned Jesus had risen. They even got to encounter Jesus and worship him right there in the garden. All of this is found in Matthew 28, as well as in the other Gospels. While all of this sounds outrageous and impossible, the event is remarkably well supported through various historical documents and sources. For a quick summary of why one atheist became a Christian after trying to debunk Jesus’ resurrection, see this video by Lee Strobel. There are many events happening in April at St. Stephen’s! After celebrating on Easter Sunday, we will be spending the weeks between Easter and Pentecost looking at the many different ways we are invited to worship God. This is really the only logical response to our risen Saviour, as seen by the reactions from his disciples. Did you know, you can worship God at work? Through your wealth? In nature? I look forward to worshiping with you in many ways this month! I am going to end this with very exciting news. Pegi Jenkins has graciously agreed to become our permanent Worship Director! Pegi has been an integral part of our music ministry at St. Stephen’s for years, and we are delighted that we can drop “Interim” from her title. I look forward to many years of diverse worship with Pegi. This entry was posted in Uncategorized on April 4, 2018 by Meg Patterson.